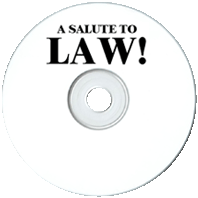 A crime and police drama a la Dragnet and Calling all Cars, A Salute to Law features Nick Harris catching those who are guilty of "the folly of committing crime.Slightly different in tone to the aforementioned series, A Salute to Law stressed an overarching moralistic theme in regards to crime and punishment. The police officer is portrayed as not only one who penalizes but also a provider of moral guidance. Frequent is the theme of the young woman turned to crime later to be redeemed thanks to her police officer/rescuer. The shows themes and stories are unique and interesting and the splendid organ interludes stress a sense of emotion and godliness. Be the first to comment on "Salute to Law"